Just take a look at that cover! Look at it! Are they kidding? No, they weren't-and that's just what makes it so funny! 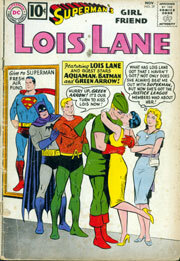 I'd only been buying super-hero comics for a few short months when I picked up this specimen, but even as a relatively uniformed reader, I had to pause and wonder-didn't Justice Leaguers have more important ways to spend their time than to lock lips with the Man of Steel's erstwhile lady friend? Not if they wanted to save the big fella's life, as it turned out! Let me attempt to boil down editor Mort Weisinger's overly convoluted plot for you: Lois apparently carries a special lipstick with her at all times which contains a trace of a specific strain of red kryptonite, one that that will counteract the deadly effects green kryptonite poisoning has on all native Kryptonians, like, well, you know who. So one fine day, spotting Krypto the Super-Dog using smoke to write a large "L" in the sky overhead, the sharp-witted girl reporter realizes that the top-secret Plan "L" has been put into motion. Letting no one-including the hapless reader-in on what's transpiring, mainly because she fears the baddies have her under observation, she concocts elaborate situations that allow her to get up close and personal with a number of costumed crime fighters, smooching with them, all the while whispering her plans into their ears. 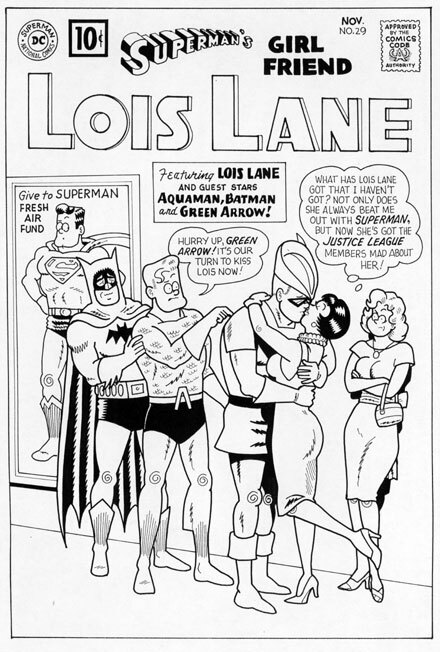 Each happy fella wipes Lois' sloppy kiss off onto one particular hanky, and when they've accumulated enough of her special smears, Batman delivers it to a prone Metropolis Marvel, lying stricken near the Arctic location of his vaunted Fortress of Solitude (did I mention that Plan "L" goes into operation when ol' Supes finds himself devastated by green K in the nearby environs of his home away from home? How else do you think Batman knew where to deliver the goods? He ain't THAT good a detective!?!…). The heroic hanky quickly revives Superman. Back at full strength, the big S chases off his alien captors by threatening to destroy them, a move which is glaringly out of character even in an era when characterization barely registered. But hey, we were almost at the end of this nine page story-yes, all this and more took place in a mere nine pages-and things needed wrapping up, hence, " Geddoutta here, youse spacemen, or I'll kill ya all!!" And all the while, poor Lana Lang, on scene for each lusty encounter, but privy to absolutely NONE of this subterfuge, has to be thinking to herself time and time again, "Omigosh, did she just slip him the TONGUE?! ?…"